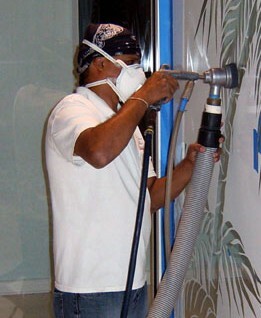 Creative Etchings of the Palm Beaches, etched glass on site. Creative Etchings can now bring what was once considered an expensive luxury into your home or office at very affordable prices. An innovative technique, using our exclusive recovery process, has been perfected that allows your existing glass to be etched at your location with no mess and without major disruption. Our experienced design consultant will come to you and assist you in creating a custom idea that can be etched on-site. Why not consider an elegant alternative in window, wall or door treatments. The beauty, individual distinction and design alternatives will offer value with affordability to your existing home or office.